When I learned how to make a tiramisu recipe it seemed to me to be one of the authentic Italian desserts. I started thinking back to when I first made one of these desserts and I could only go back to the “nineties”. After a little research, I found one report that this dessert originated about 1979 or 1980 and maybe not even in Italy. Another report says it was created in Siena and migrated to Florence in the nineteenth century. Recently, the mascarpone cheese was added to the original custard. There are other stories linked to tiramisu and it could have begun in Greece or another country. When I was learning how to make a tiramisu recipe, it seemed to be one of the traditional recipes. The more research I did on this dessert, the more I believe it is linked to several countries. The name tiramisu means a pick-me-up. I believe that the caffeine in the strong coffee and cocoa powder along with the sugar is the kind of pick me up I love. There are many versions of the tiramisu recipe; perhaps this is why there are so many references to the origination. There is even a whole layer cake tiramisu, but typically it is a layered dessert filled with creamy custard called zabaglione in Italy. More recent filling recipes include mascarpone cheese. The traditional Italian recipes use lady fingers, Marsala and strong coffee like espresso. A tiramisu recipe is made by soaking the ladyfingers in the coffee and then layering them. Unlike other desserts, the sogginess of this soaking process gives some reason to call it a soup. Some say this recipe was created in Siena way back in the 1600’s where it was called the Dukes soup. From there it is believed to have migrated to Florence. Here it is known as the English soup because of the many English people there. Whatever you want to call it, tiramisu is a very delicious dessert. Despite how elegant the tiramisu recipe appears and how delicious the taste, it is not hard to make. With layers of saturated light airy ladyfingers and a wonderful creaming filling of mascarpone cheese, this is one of the most requested Italian desserts. The light ladyfingers are made with eggs, sugar and flour; after baking they are trimmed for easy fitting in a pan or molds. No matter what alcohol is used or what flavors you add to the filling, this dessert is a sight to behold. And eat! Combine and blend coffee and Marsala; dip lady fingers and line a shallow casserole dish (8X8 inches) or individual dishes. NOTE: I always use more lady fingers because I also line the sides. Even when I make individual desserts, I use more. I usually use about 35 lady fingers (3X1 inches size). Combine sugar, whipping cream, flour and beaten egg yolks in a heavy saucepan. Whisk and cook over medium heat until thickened about 20 minutes; cool completely. Beat mascarpone cheese until smooth; beat in cooled mixture, vanilla and coffee liqueur. Spoon mixture over soaked lady fingers. NOTE: You might want to only add ½ of mixture, another layer of soaked ladyfinger and then the remaining cheese mixture. Prepare following topping and cover cheese filling. Beat whipping cream with mixer on high gradually adding the sugar. Continue beating until stiff peaks form; spread over the cheese mixture; sift cocoa powder lightly over top. Garnish as desired; refrigerate several hours to set. This is a nice presentation for tiramisu recipe. Beat egg yolks and sugar together until light and fluffy. Add vanilla extract and flour mixture and blend well. Beat egg whites until stiff but not dry; fold whites into batter just until blended. Spoon batter into ungreased tube pan; bake about 45 to 50 minutes or until pick comes out clean. Remove cake from oven and invert upside down to cool completely. Combine espresso, water and sugar; bring to a boil stirring until sugar dissolves. Remove from heat and stir in rum; set aside to cool. When cold drizzle over cake layers before spreading cream filling. Mix sugar, flour and salt in top of double boiler. Add cream and espresso and cook 10 minutes stirring constantly. Add a small amount of hot mixture to beaten egg yolks. Return mixture to double boiler and cook about 2 minutes or until thickened. Stir in rum and butter; cool. Place top slice of cake cut side up on cake platter, drizzle with soaking liquid, spread 1/3 cream mixture. Place next slice of cake on top, drizzle with liquid, spread top with cream. Place last slice on top, cut side down (this is the section on bottom of pan), drizzle, spread cream on top. Refrigerate for a couple of hours or until cold and set. Whip 1 pint whipping cream with ¼ cup powdered sugar and 1 teaspoon rum until stiff; cover sides and top (over cream) of cake. Sift unsweetened cocoa powder over the top of whipped cream. Preheat oven to 350F degrees; grease and flour 12 X 17 half sheet pan. Combine in large mixing bowl egg yolks and 2 tablespoons sugar; beat on high for 2 minutes. On low speed slowing pour in flour and beat just until blended. Beat egg whites on medium speed to soft peaks gradually adding remaining sugar. Increase speed to high and beat until peaks are firm. Fold egg whites into egg yolk mixture just to blend; fold in the melted chocolate until well mixed. Scrape into prepared pan and spread out evenly; bake about 15 minutes or until pick comes out clean. When cake is cook cut out 24 circles with 2 inch cookie cutter; set aside. Combine water and sugar; bring to boil and cook until mixture is clear and sugar dissolves completely 3 to 5 minutes. Combine hot syrup with remaining ingredients; stir until blended and set aside to cool. Beat mascarpone in mixing bowl until fluffy; in another bowl melt chocolate over simmering water. Set another large heatproof bowl over simmering water; whisk egg yolks and ¼ cup sugar until sugar dissolves and mixture is hot to touch. Scrape hot mixture into mascarpone mixture; beat just to combine. On low speed blend chocolate into mascarpone mixture and mix well. Beat egg whites to soft peaks gradually adding remaining ¼ cup sugar; beat until firm peaks. Fold egg whites, Kahlua and rum into mascarpone mixture. Spoon 2 ounces mascarpone filling in bottom of 8 ounce cup. Dip cake circle into soaking liquid; arrange on top of filling. Spoon about 2 ounces mascarpone cream on top of soaked cake; then another cake circle. Each cup should have 2 cake circles and about 6 ounces mascarpone filling. Place cups on tray; cover with foil and refrigerate. 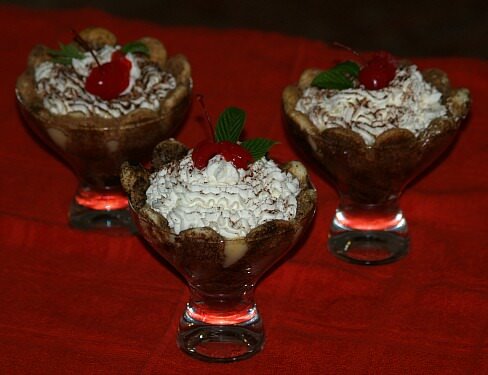 To serve, sift cocoa powder over the top of the tiramisu recipe and top with grated chocolate.